In a meteoric career that spanned a mere 12 years, Robert E. Howard single-handedly invented the genre that came to be called sword and sorcery. From his fertile imagination sprang some of fiction's most enduring heroes. Yet while Conan the Cimmerian is indisputably Howard's greatest creation, it was in his earlier sequence of tales featuring Kull, a fearless warrior with the brooding intellect of a philosopher, that Howard began to develop the distinctive themes and the richly evocative blend of history and mythology that would distinguish his later tales of the Hyborian Age. Much more than simply the prototype for Conan, Kull is a fascinating character in his own right: an exile from fabled Atlantis who wins the crown of Valusia, only to find it as much a burden as a prize. This groundbreaking collection brings together all of Howard's stories featuring Kull: "Exile of Atlantis," "The Shadow Kingdom," "The Mirrors of Tuzun Thune," "The Cat and the Skull," "The Screaming Skull of Silence," "The Striking of the Gong," "The Altar and the Scorpion," "The Curse of the Golden Skull," "By This Axe I Rule!" "Swords of the Purple Kingdom," "The King and the Oak," and "Kings of the Night." If you love Conan and Robert E. Howard's other characters, and are of the 'completionist' ilk, you will want to pick up this collection of Kull stories. The great thing about these collections are that they present Howard's stories unedited, in their original forms -- many of his stories were changed for publication or completed by lesser authors posthumously. Unfortunately, the collection's greatest strength is also its weakness. Its authenticity means that we are presented, especially in this collection, with only a few complete stories. The rest are sketches and fragments of varying entertainment value. It's a confusing soup. As you eat it you will find bites of fantastic flavor and potency, but they come at unpredictable times and only after/between many unsatisfying bites. It should also be noted that the character of Kull and the stories themselves vary a lot; for this reason, it's hard to get a sense of a singular protagonist. I enjoy Mr. Howard?? ?s works, but this really is not a book. Please note in the summary provided that it states "collection of stories." The problem is that there are only about one or two actual stories and the rest are drafts and unfinished works. There is little to no story lines and minimal character development. I found parts to be interesting, but it is not worth the credit or price. If you are interested in learning more about Robert Howard and his career as a writer this will give you some good information, but if you are looking to enjoy a book it will leave you wanting. Not only is it frustrating to listen to a story lasting only 3 pages with no beginning or end, but at least 1 hour of the audio is the repeat of stories presented earlier. A passionate performer bringing life to underappreciated tales from Robert E. Howard's (REH) early career. I absolutely love Robert E. Howard, and I have come to really enjoy Todd McLaren as well. So for me this was a great buy, and listen. However, this collection gathers' together a great deal of unfinished stories and drafts. So if your desire It's to have something more polished then this collection is not for you. Experience the beginning of Sword and Sorcery! 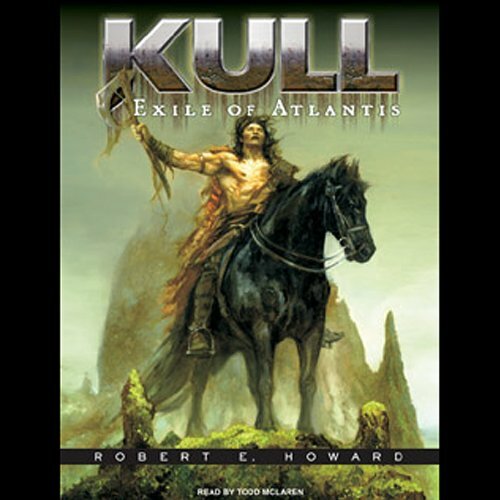 Kull is the prototype for all that follow Robert E. Howard's ground breaking story telling. Kull is not just an earlier crude version of Conan. He stands on his own as do each of Howard's characters. Your doing yourself a favor by immersing yourself in the beginning of High Fantasy. Loved it. Reads like the Conan stories. Great tales of high fantastic adventure, magic and murder. Kull is clearly the minor leagues, where Howard developed his skills about character and background and pacing. Its interesting, but unfullfilling. A few of the stories in this selection seem like filler to make it more complete and they should have been left out entirely.